The battle was a cover of 'Mary, Mary', with the contenders being Butterfield Blues Band, The Monkees, and Run DMC. It was back and forth between The Monkees and the Butterfield Blues Band, but poor Run DMC got no love from you all. 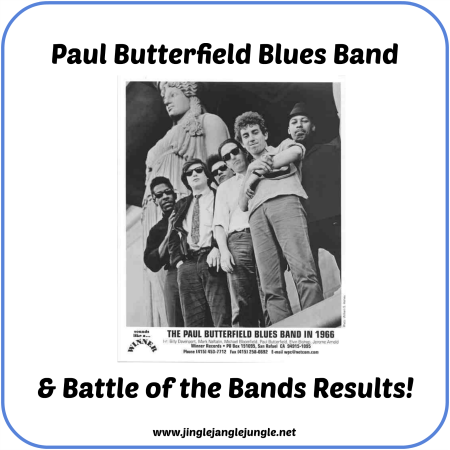 It was beginning to look as though I was going to have to be a tie breaker as of Tuesday night, but by Wednesday morning, two more votes for Butterfield Blues Band came rolling in to save the day! Thank you everyone for indulging me with your vote! We'll have a new round of battles on August 15th, with new songs and new contenders. It occurred to me during this battle that not much is known about the Paul Butterfield Blues Band. At least, they were ‘new to me’, I can’t really speak for the rest of you. So, today’s post is intended to shine a little more light on this band. 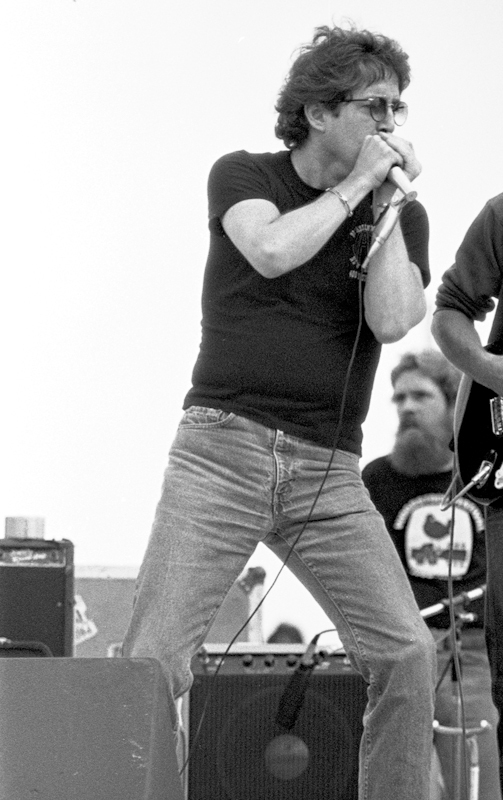 Paul Butterfield was an American blues harmonica player and singer. After early training as a classical flautist, he developed an interest in blues harmonica. He explored the blues scene in his native Chicago, where he met Muddy Waters and other blues greats, who provided encouragement and opportunities for him to join in jam sessions. He soon began performing with fellow blues enthusiasts Nick Gravenites and Elvin Bishop. Before the most recent battle of the bands, had you heard of this group before? Had I heard of The Paul Butterfield Blues Band before this Battle? I should say so! In my world, they are most famous for being the backing band behind Bob Dylan at the 1965 Newport Folk Festival. After Bob & The Paul Butterfield Blues Band (minus Paul Butterfield) played 'MAGGIE'S FARM' with the electric instruments, the crowd began booing and eventually booed them off the stage a couple songs later. That was the beginning of the huge "Dylan Went Electric" controversy. Of course, years later, in the 1970s, Dylan would again get booed while onstage when he began performing Christian Rock songs. One thing about Dylan though, he was always true to himself, and the audience could come along with him or... go to hell! Here's a URL to that infamous performance when the audience booed Dylan onstage for the first time. HOW DARE HE use electrified instruments in his performances???!!! By the way, I think Dylan's first album that included "electric" music ('BRINGING IT ALL BACK HOME') and his first album of Christian songs ('SLOW TRAIN COMING') were two of the very best albums he ever recorded in his long career. See... I am still learning new things e'ryday! I knew that Dylan got booed quite a bit, but I didn't realize that the PBBB was backing him during that festival. I like an artist that stays true to themselves. Not any of this autotuned garbage and moldable artists that we hear as of late. Thanks for dropping by! Next month should be interesting, I've only changed the song at least 3 times now, so what we really end up with is anyone's guess! I think I have my August 15th Battle already lined up, but things have been known to change last minute. "Dylan ain't gonna work for the folk crowd no more." "15 people still working for Maggie." "One of the greatest moments in music... the crowd didn't know what just happened even though they had witnessed it. Most of the kids that booed, years later probably told their friends they were the only ones cheering. haha﻿." "Dylan said: He electrified one half of his audience, and electrocuted the other." sometimes when I'm bored I read through the comments on youtube. Most are ridiculous and makes me think they were written by the same 13 yr old. Thanks to Steven for this additional info about Paul Butterfield and his band. Great insight! I had definitely heard of him prior to your poll, so maybe that made my vote a homer vote? Regardless, I discovered him by accident when I saw a couple of his albums at a flea market a few years back. I didn't know anything about him at the time, but for a couple of bucks for each album I figured it was worth the low risk. And it definitely was! I had not heard of him or his group, a crying shame, especially since the great Muddy Waters mentored him. Awesome! And, by the way, I f@#&ing hate heroin. It's ruined so many lives, especially now in the wake of the big pharm idiots screwing with the populace by over-prescribing legal opioids. ~grrr~ Sorry. I know, right? I was thinking about that as well. How did this guy play with so many great people, and yet I hadn't heard of him or his band? Learn something new all the time. Next time around, I visit you first. Sorry I missed this one, guess I let too much stuff pile up in Pocket. I would have cast my vote for Paul Butterfield. I was a huge fan of his when I was in high school, based on my heavy rotation on "Golden Butter," their compilation album from their Elektra days. 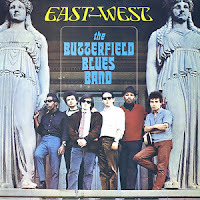 Of course, they had gone their separate ways, and Butterfield had moved to Woodstock and formed Better Days by then. I learned to play harmonica by listening to him and trying to sound like him. Even tried flipping the harmonica over and playing backwards like he did. 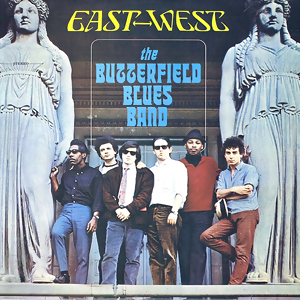 Butterfield had some of the greatest talent in the original band: Mike Bloomfield and Elvin Bishop on guitars, and two South Side veterans, Jerome Arnold and Sam Lay, on bass and drums. Later, David Sanborn played with them. Likewise, Better Days had Amos Garrett and Geoff Muldaur on guitars and Ronnie Barron (at one time part of Dr. John's band) on piano. 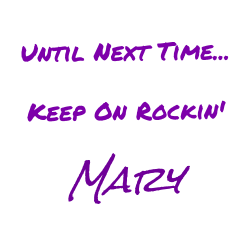 Their version of "Mary, Mary," by the way, was just something they were jamming on in the studio and they decided to add it to "East-West," their second album. The title track of that was the whole second side of the album, a twenty-minute jam in either Phrygian or Locrian mode. It's not entirely your fault, John. I posted a few days early and then wrapped up a day early. Sometimes we just gotta do what we gotta do to make things work with our busy schedules. I really didn't think the rap version was all that bad, but not good enough to beat the rivals. I was familiar with PBBB--well aware of them since the late sixties, but never that interested in buying any of their albums with my limited funds. I was often tempted to buy one of their albums because they had such a strong reputation, however blues was never a favorite genre of mine. They were an excellent band nevertheless. Sometimes you just gotta have one for the collection, though. Glad that you enjoyed the battle. What is it about blues players always riding the needle? I lost a good friend in my club days,Andy Mazilli,to heroin. We used to talk outside the first club I worked in and it was his kindness and gentle spirit that led me to book his band. That drew the ire of the local blues club owner who was upset I "stole" her biggest local act. Sorry about the loss of your friend. I don't think the drug of choice was limited to just blues players. Unfortunately, some users don't know when to stop, or they don't have the ability within themselves to stop using. Interesting battle, Mary! I voted for The Monkees, but that was mostly nostalgia talking. The PBBB version is good! I had no idea they went all the way back to 1963! Thanks for the historical info. Some excellent music here. It really was a close battle, with it being a tie right up to the very last 2 votes. If it had remained a tie, I would have swooped in with my tie breaker and voted for The Monkees as well.